Most people who come here shed their shoes immediately. Not for any reason other than the delicious sensation of wiggling their toes deep into the sand while having a meal or drink. 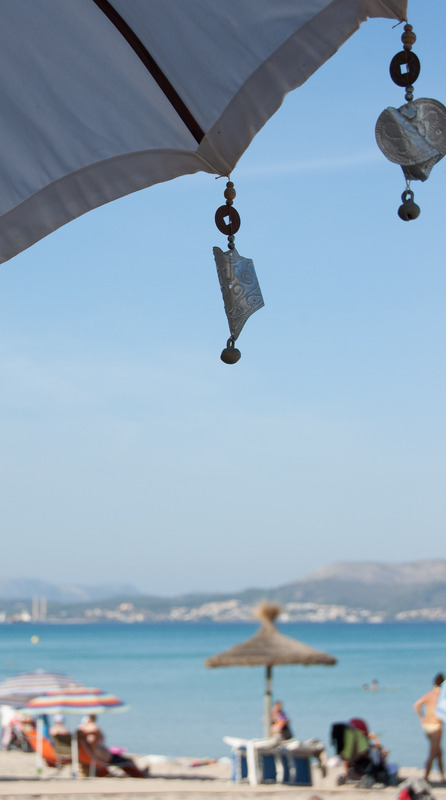 This is Ponderosa Beach: more than your average chiringuito (the Spanish name for a beach bar), this is a place to get your caffeine fix, eat well, sip a refreshing drink and, enjoy the regular live music and entertainment. Friends had told us about Ponderosa Beach early this year. We resolved to try it for ourselves. But summer – as usual – flew by, in a whirlwind of visitors, work, and domestic duties, and we were running out of time. On Thursday, lured by the clear blue sky and temperatures nudging 30 degrees Celsius, we abandoned duties and seized the day. Muro beach is long, sandy, and gently shelving, with the result that the Mediterranean appears Caribbean-blue close to the shore. We parked the car and walked along the sands, passing late season holidaymakers sunbathing and several chiringuitos, before seeing the Ponderosa Beach pennants. I’d guessed the place would be busy – having heard great reports of its food – but didn’t expect to see quite so many people eating here on a Thursday lunchtime in October. The only empty tables had reserved signs on them. A smiling man – we think he was the owner – emerged from the kitchen area and welcomed us warmly. He told us he had some more tables at the side of the chiringuito and led us to the one he claimed was his favourite of all. It was perfect. We made ourselves comfortable (kicked off our shoes and buried the feet) and studied the menus. 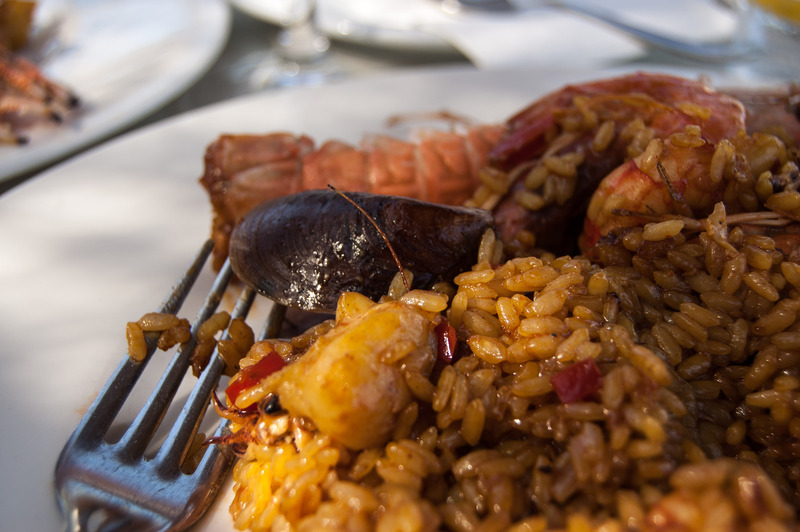 We were already sold on the idea of the recommended seafood paella (17 euros each for minimum of two people), but there are plenty of other options, including fresh fish, meat, a kids’ menu and a couple of dishes for vegetarians. There’s also a vegan burger (12 euros), made from millet, cashews, mint, and vegan cheese, served with lettuce, tomato, a sweet pickle, artisan cornbread with sunflower seeds, home fries, and salad. 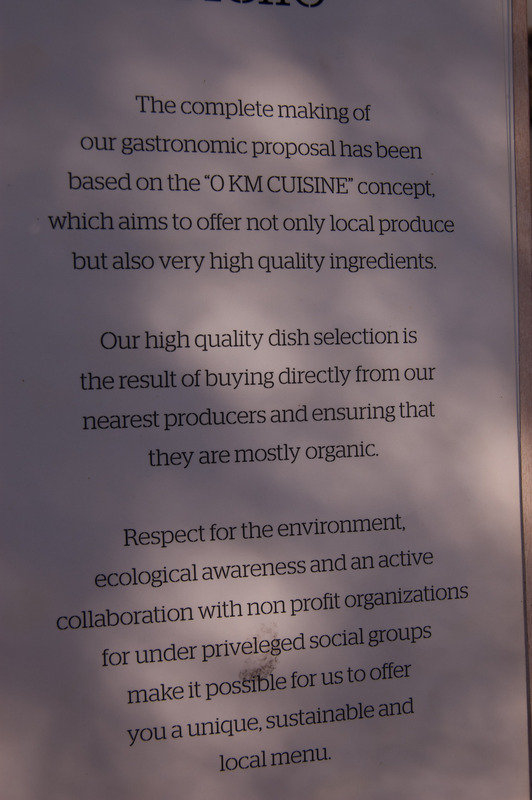 I don’t recall visiting a chiringuito anywhere else on Mallorca serving a dish specially designed for vegans. Do you know of any others? We ate: a delicious seafood paella, based on a flavourful stock that delivered both the aroma and taste of the sea; we had a refreshing dessert of lemon ice cream drizzled with limoncello and served with a small sweet biscuit. We rarely drink alcohol at lunchtime but took the opportunity to try the Lolea sangria they introduced this summer. Both white and red versions made a refreshing liquid accompaniment to our food. The service was friendly and relaxed; some may say a bit slow, but if I’m eating or drinking at a chiringuito I’m more than happy not to be rushed. Especially when the view and ambience are so lovely. Ponderosa Beach closes over the winter, usually from late October, reopening again in early spring.